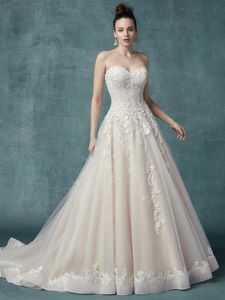 Description: Floral lace motifs dance over tulle in this unique princess ballgown, accenting the geometric embroidery and beading on the bodice, sweetheart neckline, and hemline. Complete with covered buttons over zipper and inner elastic closure. Illusion off-the-shoulder jacket with elbow-length sleeves and lace motifs sold separately.